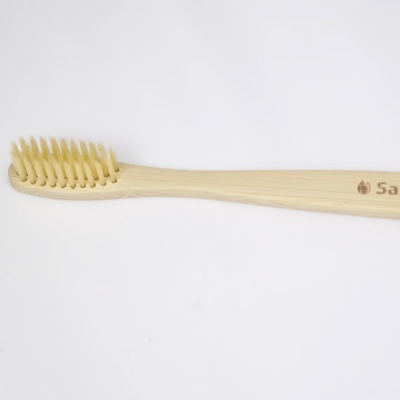 A bamboo toothbrush with bamboo fibre, medium soft bristles! Available with buy more pay less options. A bamboo toothbrush with bamboo fibre bristles! The handle is compostable at the end of its life. BPA free and vegan-friendly. From Save Some Green, a UK company. Medium soft bristles. This bamboo toothbrush is adult sized with medium soft bristles. Because this bamboo toothbrush does not come in a variety of colours, you need to customise your toothbrush to differentiate yours from others in the household. We recommend writing your name in pencil on the handle, or being creative and decorating your toothbrush to suit your personality.